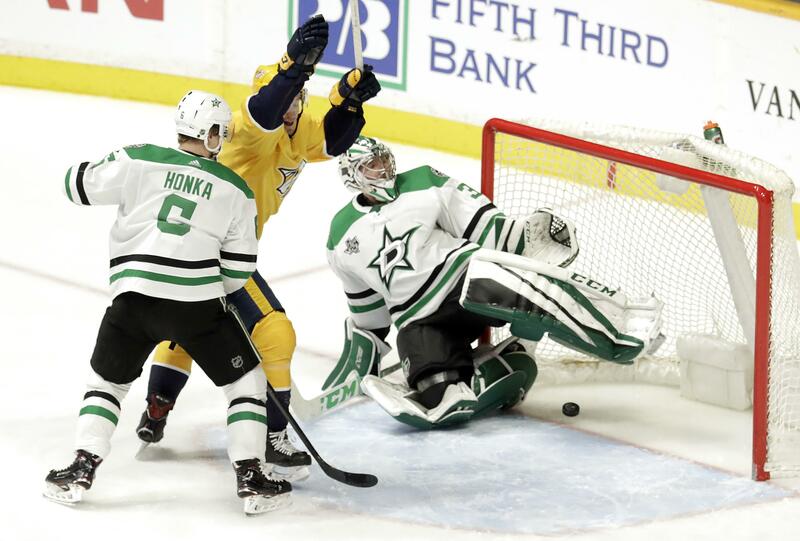 Tue., March 6, 2018, 10:41 p.m.
NASHVILLE, Tenn. – Pekka Rinne stopped 26 shots, Ryan Hartman scored at 5:33 of the third period and the Nashville Predators beat the Dallas Stars 2-0 Tuesday night for a franchise-record ninth straight victory. The Predators extended the NHL’s longest active winning streak. The defending Western Conference champs also padded their lead atop both the conference and the Central Division. Rinne recorded his seventh shutout this season, tying Tampa Bay’s Andrei Vasilevskiy for most in the NHL. Rinne now is 17-1-1 over his last 19 games. BOSTON – Brad Marchand completed his hat trick 34 seconds into overtime and Boston escaped with the victory over Detroit after twice squandering a two-goal lead in regulation. Torey Krug had two goals and two assists, and David Pastrnak had three assists for the Bruins, who won for the fourth game in a row. ANAHEIM, Calif. – John Gibson made 36 saves for his 14th career shutout, Rickard Rakell scored for the fourth straight game and Anaheim extended its home point streak to nine games with a win over Washington. Adam Henrique, Hampus Lindholm and Nick Ritchie also scored for the Ducks, who passed San Jose for second in the Pacific Division. Ritchie scored an empty-net goal, and Ryan Getzlaf and Josh Manson each had two assists. Braden Holtby was pulled early in the second period after giving up three goals on nine shots. Philipp Grubauer made eight saves in relief for the Capitals, who have lost three straight road games. ST. PAUL, Minn. – Eric Staal’s second goal of the night capped a franchise-record flurry to start the second period, and Minnesota cruised past Carolina. Devan Dubnyk made 29 saves for his fifth win in his last six starts, and the Wild raised their home record to an NHL-leading 24-5-6. Nino Niederreiter, Zach Parise, Daniel Winnik and Staal scored in a span of 3:28, the fastest four-goal stretch in Wild history that gave the home team a huge lead less than four minutes after the first intermission ended while fans were still filing back into their seats. Staal, the second overall pick in the 2003 draft by the Hurricanes who spent 13 years with the club until a late-season trade, has 64 goals in 149 games with the Wild. Phillip Di Giuseppe and Derek Ryan scored for Carolina in the third period. NEW YORK – Patrik Laine got his fourth hat trick and set a career high with his 38th goal, lifting Winnipeg over New York. The 19-year-old star had been the youngest ever with three hat tricks – getting there at 18 years, 302 days – but it had been over a year since his last three-goal game. Laine is now two goals behind Washington’s Alex Ovechkin for the NHL lead this season. Henrik Lundqvist made his 798th career appearance and stopped 31 shots as the Rangers lost for the first time in four games. NEWARK, N.J. – Taylor Hall extended his point-scoring streak to 19 games, Travis Zajac scored two power-play goals and New Jersey beat Montreal to snap a three-game skid. TAMPA, Fla. – Brayden Point scored 2:49 into overtime to give Tampa Bay the victory over Florida. Point scored his third overtime goal of the season. Yanni Gourde scored twice and finished with three points for the Lightning, who reached overtime for the sixth consecutive game. J.T. Miller added his 15th of the season, second with the Lightning. COLUMBUS, Ohio – Joonas Korpisalo stopped 37 shots, Artemi Panarin and Pierre Luc-Dubois each had a goal and two assists, and Columbus beat Vegas. Zach Werenski and Ian Cole also scored for the Blue Jackets, winners of two straight and four of their last six. The victory over the Pacific Division-leading Golden Knights helped Columbus hold onto the second wild card in the Eastern Division with 15 games remaining. Marc-Andre Fleury – a Blue Jacket-killer in the playoffs last year for Pittsburgh – had 17 saves for the Golden Knights, who have lost four of five. Erik Haula scored for Vegas. CHICAGO – Jonathan Toews scored nine seconds into overtime and had an assist in regulation to lead Chicago past Colorado. The game-winner was generated directly from the faceoff at center ice. Toews pulled the draw to Duncan Keith, who fed Patrick Kane on the right side. Kane fed Toews on a 2-on-1 and the Chicago captain chipped his 18th goal past Semyon Varlamov from the low edge the right circle. Chicago’s Jean-Francois Berube stopped 33 shots and Erik Gustafsson connected in the first, as the fading Blachawks won for the second time in five games. Colorado’s Nathan MacKinnon extended his points streak to six games with his team-leading 32nd goal in the second period. Published: March 6, 2018, 10:41 p.m.